Hey y'all! This is the final installment of my retinoid series, which means my 6 month Retin-A trial review will be coming up next (see it here). 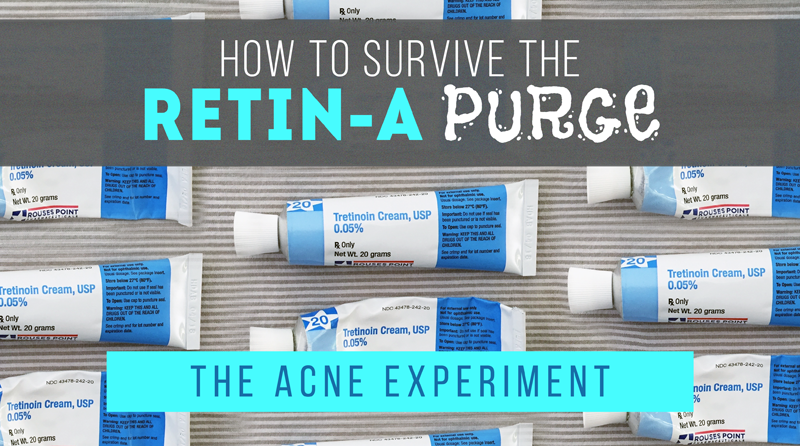 In this guide, I'm going to share with you what I've learned about Retin-A purging through tireless research or, more accurately, based on my own two tretinoin purge experiences. A purge is characterized by whiteheads / little bumps in the areas of your face where you normally break out. In the case of Retin-A purging, it is often accompanied by some fun flaking action and redness. What does a purge looks like? What doesn't a purge look like? 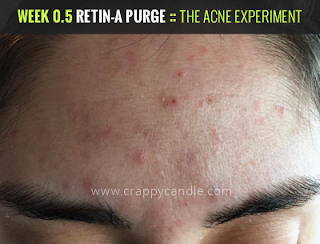 In general, purging does not involve inflamed acne. That doesn't mean you won't get zits while you're purging (faces are vindictive jerks in that way), but if you suddenly have a face of big painful cysts where you don't normally get 'em, something else may be going on. Also, if your skin is super raw, you might be using too much of the product. Ease up soldier. 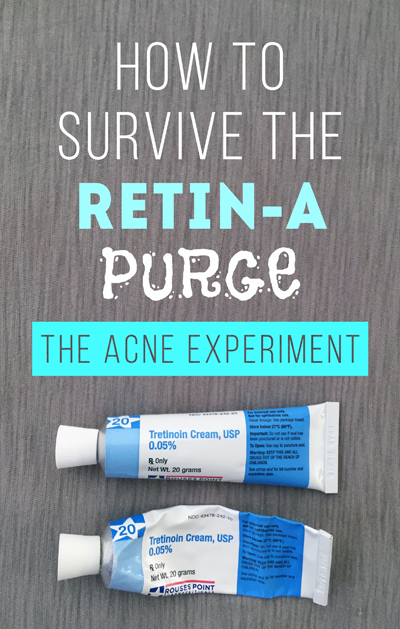 Retin-A purging can last anywhere from a couple weeks to a couple months (eeeeeee). Of course, this will vary from person to person. My "peak-purging" didn't last for more than about a week or so, beginning almost immediately after I started using it. Some lucky SOBs don't purge at all. How long shouldn't this last? While the full effects of tretinoin won't be seen until 6 months – 1 year (or more), if you're still having a lot of redness, irritation, peeling (etc) after say, month 3, you can try easing up on application frequency or concentration. Doctors/derms can be very helpful in determining what is normal, and what is not. Is there a way to lessen the severity of a purge? Use a teensy tiny bit of it. Like, pea-sized or less (I probably used half that amount to start). Even after you get through the purge, you may not need more than this. Start with a lower concentration. Tretinoin comes in 0.025%, 0.05%, and 0.1%. 0.05% is the most commonly prescribed dose, but if your skin is sensitive, you may find 0.025% to be a better starting point. Try the cream first. I've used both 0.05% cream and 0.025% gel, and I found the cream to be milder. Wait 30 minutes after washing your face before applying Retin-A. Buffer it with oil or moisturizer. You can do this by applying a thin layer of oil/moisturizer before you apply the Retin-A. Similarly, you can actually mix the two together in your hand before applying. If your skin is very sensitive, you can even layer then mix. Don't apply Retin-A every night. Every-other night, bi-weekly, or even once-weekly application can be and have been done. You can also start out with 1-2 times per week application, them bump it up gradually. If irritation is minimal, you can apply Retin-A to bare skin, then apply oil or moisturizer 15-20 minutes after. The moisturizer won't cut the tretinoin in the same way buffering it will, but it will help sooth your skin. 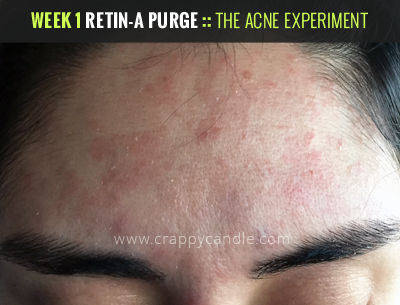 What can do before starting Retin-A to prep my skin? Make sure you have a very mild, non-drying cleanser locked-and-loaded. Test new products before you start. // My recommendations: See my full cleanser guide. Wear plenty of sunscreen during the day. You should to do this while using tretinoin also, so it's a good habit to get into. Plus, there is no world where starting tretinoin with a sunburnt face is a good idea. Cut back on chemical & manual exfoliation, or better yet, cut it out entirely a few weeks before you start. How do I "Survive the Purge" as you say? Moisturize like a maniac. I don't care if your skin is already oily. Don't argue with your mother. Don't wash your face more than twice a day, and use a very gentle cleanser. If you wash your face too much or use something that is too drying, you could add to the irritation and make things worse. Avoid all other potential irritants. Do you use chemical peels? Knock it off! Does your face wash have salicylic acid in it? Find a milder one! In love with your alcohol-based toner? Drink it instead. Need to wax your goatee? ackk Wanna rub lemon all over your face? Please STAHP. Don't manually exfoliate your face. If the flakes are driving you nuts, use a clean wet washcloth and very lightly/gently run it over your face – like one or two passes. Rinse, then dab your skin dry, and immediately apply your moisturizer or oil. Avoid exposing your face to hot water. Tepid (lukewarm) water is fine, but I've actually found that straight up cold water works best to calm my skin. Get a dog and pet its tiny head. What do I do if my vindictive jerk skin is still breaking out after months of Retin-A use?? Guess what? -- Spoiler Alert -- I currently find myself in this situation. I took that as my cue to tweak my Retin-A routine. You may need to alter application frequency or use a milder formulation (like Retin-A Micro). You may even need a stronger formula (ask your derm!). You may need to switch up some of your other products – cleanser, moisturizer, toner, foundation, hair products. You may need to add another active acne fighter to the mix, like antibiotic topicals or mild exfoliants. And, of course, you may find that Retin-A just doesn't work for you :(. Where can I get Retin-A? #1: Make sure your doctor is prescribing it specifically for acne. Insurance companies will not cover tretinoin for anti-aging/wrinkle treatment. (I've even heard that it can sometimes help to have your doctor say it's for back acne treatment, but don't quote me on that). #2: If you can't get insurance approval, shop around at a few different pharmacies. You can ask for the price before they fill your prescription, and you may find a better deal somewhere else. I've heard that Costco has good prices (and doesn't require a membership at their pharmacy). GoodRx offers discounts as well. #3: Even if #1 and #2 are no-dice, remember that a tube of tretinoin will last you a very long time. I've been using the same tube daily for the last 7 months, and I still have a some left. If I had spent $100 on it, it would work out to about $15 a month, which is a less than what I might have spent on an OTC retinol. #4: Get the generic. Both Retin-A (tretinoin) and Retin-A Micro (tretinoin gel microsphere) are available as generics. Generics are virtually identical to their brand name counterparts. In the case of tretinoin, it is more important to choose the right inactive "carrier" (ie the cream or gel the tretinoin is in). That's it for now, my friends. Good luck. God speed. Stop picking at it. I'm just starting tretinoin .05% cream for moderate acne, and because I'm a masochist I'm freaking myself out reading about the supposedly evil comedogenic isopropyl myristate in the cream formulation. I feel depressed because I'm worried I made a poor choice of product from the get go, and I wanted to have a good attitude going into this. Do you have any insights about this or am I just nuts? Thanks for the reassuring response! I just have to bite the bullet and if it doesn't work, at least I tried. Looking forward to your next post! Girllll when are you going to post next? I love your blog!!!!! In love with your alcohol-based toner? Drink it instead! Step 6 is my favorite though, and one I can easily accomplish. I started Retin-A a little over a month ago, and I'm using it every other night as a mask and trying to wear it overnight every 4th night but still have such bad peeling and cystic acne like crazy (5 cortisone injections in ONE month and I see a little baby one forming again UGH). My derm recommended peels every 2 weeks even while using Retin-A - have you done peels before? You recommend avoiding salicylic acid while in the purge phase so I'm wondering how much worse it will make my skin. Also, did the Retin-A eventually help with your cystic acne? I originally found your site after discovering hydrocolloid bandages, so my third question would be do the HCBs help with unopened cystic acne spots? Thank you in advance!! Love your blog. Step 6 is my favorite as well. :) I haven't done a peel before, but if your derm recommends it, I'd go for it. Your doctor will have a better idea of what your skin can and cannot tolerate, and can tell you if any reaction your having is normal. In my case, my derm recommended switching to a higher concentration Retin-A (0.01%) -- it's something I never would have thought I'd be able to do, and it ended up being the right choice for me. I get the majority of my cystic acne on my chin. Those suckers basically only pop up if I used a foaming cleanser (it took me a super long time to figure that out btw). Most other inflammed acne I get comes and goes very quickly with the Retin-A; I make sure I dab it right on trouble spots before rubbing it in -- sometimes they don't even fully form when I do that. Generally, I do not believe HCBs will help with deep nasty cysts. I reserve them for acne with a whitehead. If that crud doesn't have a "route of exit," the bandage won't be able to do its job. I just started 0.025% tretonin, and 7.5% Aczone (dapzone) gel. I'm supposed to use both each day- but I only apply one per day. Aczone- 5 days of the week, and tretonin 2 days of the week- and always at least 3 days apart. Most people just drop out at the start of a purge (or because of a bad reaction) so the lack of evidence of those who survived the purge suddenly didn't surprise me anymore because they probably had the same mentality. My derm wasn't super informative (she first prescribed me epiduo! T__T, which I told her had burned my skin in the past when I was a teen), and since I'm a very cautious person I just took baby steps and tried to console myself when I saw a few more bumps than normal. But this has been so helpful and comforting. I have mild/moderate acne- and combination- non-inflamed on my forehead and inflamed on my cheeks. It's really not a HUGE issue, but I'm 23 already and hey, it's irritating- and the small cluster of whiteheads on my forehead is not cute. Anywhoo, thank you so much for posting this and experimenting for yourself and your readers. You're very brave! I love how you covered ALL the bases- from wash, and type of filler, to price and everything else! Amazing! You've given me the confidence to continue with the routine I've established- and now I feel like I'm doing all the right things. I am slowly bumping up the usage of tretonin- but will probably keep it at 2x a week, for at least 2 weeks. I use Cetaphhil gentle cleanser (gel) 3x a day- (1x in the afternoon after my shift at a school- to get off the dirt and germs from the little kids haha). I wait for 15 minutes before applying the gel or cream after washing my face, and wait again after to apply hemp seed oil. I never wear foundation or BB cream- only eyeliner, eyebrow pencil, and blush to keep my skin 'breathing' as much as possible. I apply a physical blocking sunscreen (zinc) spf 50 in the AM before work. 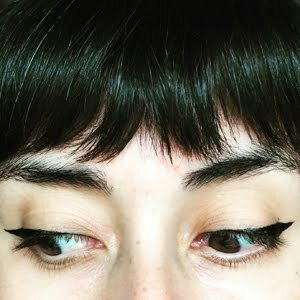 I have rather oily skin, and it really makes me pale, so I don't apply it throughout the day after that- and while it's not perfect I think my routine works for me. I'm very busy and the routine is manageable. Thank you for giving me confidence in what I'm doing- I'm already seeing some positive results. Now I'll be even more confident to keep with my routine and not change it out of nervousness. You're so detailed and thorough! I love it! Btw for a price reference: I have Blue Cross Blue Shield and I'm on it as part of my mother's plan from her work. I had to use a discount card (which is on their site) but surprisingly the awesome specialty pharmacy it came from already applied the discount card before charging me. Good luck with everything Shay! <3 Keep writing!! I'm pretty sure getting a pup is the only way to survive the purge, definitely brutal, but so worth it! Great article!